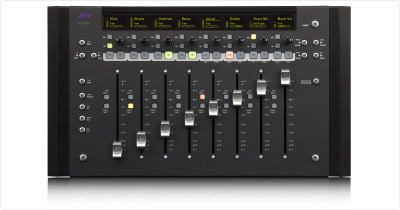 AVID Artist Mix : The Artist Artist Mix control surface puts eight motorized faders and an array of programmable buttons and knobs at your command for maximum control over your DAW in a small footprint. Euphonix put some of the coolest features from its impressive full-sized consoles into the Artist Mix, including touch-sensitive, responsive faders and multi-function rotary encoders. This well-designed box is ultra-functional, while sporting a decidedly uncluttered appearance. Now you can get the most out of your DAW with the compact, versatile Artist Mix! The Artist Mix's rotary encoders give you direct control over everything from panning and gain to editing your most powerful plug-ins and EQ. These knobs and keys can also be pressed to select/deselect and navigate through parameters. Knob set selector keys allow you to quickly assign the rotary encoders to control plug-ins, EQs, panning, signal routing, and much more. You can either control the same parameter across all tracks or assign all knobs to one track for easy editing of multiple parameters at once. High-quality ALPS 100mm long throw faders offer accurate and smooth mixing; touching a fader will automatically select the corresponding track. Euphonix consoles are renowned for their quality components and smooth operation, and now the MC Mix gives you that "feel" in an affordable, compact unit! High-resolution 128 x 64 pixel OLED display provides track name/number, detailed metering (from mono to 5.1 surround data), parameter name/value currently being modified by its corresponding rotary encoder, current automation mode, and more. The Artidt Control and Mix feature EuCon™, a high-speed control protocol developed by Euphonix that enables simultaneous control of multiple applications and even workstations over an Ethernet cable at 250 times the speed and eight times the resolution of MIDI. EuCon automatically detects whatever application is in the foreground and instantly sets the high-resolution touchscreen and displays, motorized faders and arsenal of controls to match.